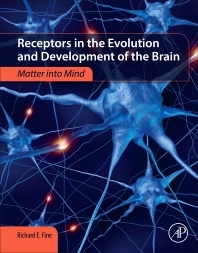 Receptors in the Evolution and Development of the Brain: Matter into Mind presents the key role of receptors and their cognate ligands in wiring the mammalian brain from an evolutionary developmental biology perspective. It examines receptor function in the evolution and development of the nervous system in the large vertebrate brain, and discusses rapid eye movement sleep and apoptosis as mechanisms to destroy miswired neurons. Possible links between trophic deficits and connectional diseases including Alzheimer’s, Parkinson’s, and ALS are also discussed. This book is extremely useful to those with an interest in the molecular and cellular neurosciences, including those in cognitive and clinical branches of this subject, and anyone interested in how the incredibly complex human brain can build itself. Dr. Richard E. Fine received his Bachelor’s and PhD degrees in Biochemistry from University of California at Berkeley and Brandeis University respectively. He then was a postdoctoral fellow in the laboratory of Francis Crick and Sydney Brenner at the Laboratory of Molecular Biology in Cambridge, U.K. During this period he and his colleague, Dennis Bray provided the first evidence for actin in growing neurons. Dr. Fine became an Assistant Professor of Physiology and Biochemistry at Boston University School of Medicine and demonstrated the existence of actin regulatory molecules, tropomyosin and troponin C in growing neurons, and he subsequently became interested in the role of clathrin coated vesicles in endocytic and exocytic processes in neurons and in other tissues. He also isolated and characterized vasopressin receptors, demonstrated for the first time that a large molecular, transferrin, can cross the blood brain barrier. Our lab in collaboration with Dr. Ken Kosik were the first to show that an antisense oligonucleotide can be used in vivo to block the synthesis of a single protein. Using the rabbit retina we were able to show that an antisense nucleotide against the kinesin mRNA can block the critical role of kinesin in the transport of synaptic vesicles, neuropeptide containing vesicles and vesicles destined for the plasma membrane. In recent years Dr. Fine’s laboratory has focused on the role of the amyloid beta peptide in Alzheimer’s disease especially in brain capillary endothelium. Also he has recently focused on the role of a mutant protein VPS35, a component of the retromer in Parkinson’s and Alzheimer’s diseases. During his career he has received over $25,000,000 in grant funding, have served on both NIH and VA review panels and authored or co-authored over 100 research papers.